The Diamondback Response Sport Mountain Bike is the latest hardtail mountain bike in the Diamondback range. Unlike full-suspension mountain bikes, the Diamondback Response Sport Mountain Bike combines utility with hardtail performances. That makes the Diamondback Response Sport Mountain Bike perfect for many different situations like cruising around the neighborhood, gravel trails or even just around town. The Diamondback Response Sport Mountain Bike gives you several beneficial upgrades over the standard version. These upgrades include the more substantial Weinmann double wall rims, as well as 6 inch disc brakes from Tektro Novela. Combine these upgrades with the smooth rapid fire trigger shifter, allowing you to move quickly and smoothly between eight different speeds, and you will be ready for any terrain that dares to stand in your way. Available in five different frame sizes – XL (22 inches), L (20 inches), M (18 inches), S (16 inches) and XS (14 inches). Since the Diamondback Response Sport Mountain Bike is made of aluminum, it is both lighter and stronger than bikes made over the last decade or so. The brakes are quite strong and like a lot of other offerings from Diamondback it looks incredibly sharp. The shifting gears are obviously entry level, and the tires feel somewhat on the heavy side but still acceptable. The biggest downside to the Diamondback Response Sport Mountain Bike is the front shock, which barely feels like it offers any absorption at all, yet it doesn’t feel like it will be likely to break. Overall, the Diamondback Response Sport Mountain Bike is a great bike that has mid-range components and a nice high-end frame. It arrives well-packaged and is quite easy to assemble, but you should count on spending a full afternoon setting everything up correctly if you decide to not take it in for a professional tune up before you hit the road. If you plan on doing any serious track riding with this bike, you may want to think about upgrading the pedals. The included platform pedals are ok if you are simply riding around town and on local park trails, but are somewhat lacking for more serious tasks. Another upgrade you could see a lot of benefit from would be to add a high quality suspension seat post. This will give you some lighter weight as well as soften some of the rough bumps you will undoubtedly feel thanks to the subpar front shock absorber. Diamondback Mountain Bikes have done an incredible job packing features and quality into such an affordable package. You are unlikely to find anything else on the market that provides as good a value as the Diamondback Response Sport Mountain Bike does. 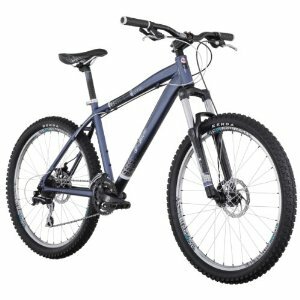 The RRP of this bike is $499.99, and at the time of writing Amazon were offering 45% off – you’ll be pushed to find many well known bike manufacturers offering such great prices. With over 35 four and five star reviews on the site, you can be sure of a quality product – there are few rated higher on Amazon and other bike stores online. More reviews of the Diamondback Response can be found here.